Have you ever taken a knife to a gunfight? Fly fishing for tarpon can feel just like that. Like you should have brought bigger tackle. Surprisingly enough though a good fly fishing angler can take a decent sized tarpon down in just a few minutes using the right leverage. Fly fishing for tarpon is a blast. Just seeing the fish is amazing, then, hook one and let the fun begin. A good presentation off of a nice strong and accurate cast will fool this giants in to eating the fly and showing you the thrill of a lifetime. I have been fishing the tarpon here in Key West since the early 90's. In that time I have learned where, what and why tarpon do what they do and can consistently put my anglers on fish. I offer 4, 6, and 8 hour fly fishing for tarpon charters on board either my flats boat or my yellowfin bay boats. (most prefer the bay boat). The cost is the same. We can go early morning or in the afternoon or evening. During the migration expect to see 50 - 400 fish in a fly fishing trip with me ranging in size from 40 - 150 lbs. Please see my Rates Page for costs and information. I will fish with 2 persons or less with one fly fishing caster at one given time alternating. If you wish to bring more than 2 persons please call my office we know many fishing guides that can help you. If you decide to bring your own gear. Make sure it has a lifetime or still in warrantee. 11 or 12 wt rod with a reel that has excellent drag with lots of line capacity for good amount of backing. 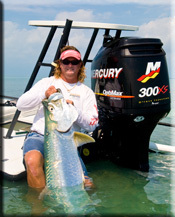 Most everyone knows that the Key West tarpon migration is in the spring. May and June are the hot months where the fish are on the flats and ready to eat a fly. But, the best kept secret is the rest of the year. May and June are without a doubt prime time to go fly fishing for tarpon on the flats during the migration. Sight fishing for tarpon in less than 3 ft. of water. Sometimes tough conditions for casting due to a bit higher winds, but, layed up fish and deeper fish eat well and can be a lot of fun. These fish are mostly Gulf Of Mexico fish (brown backs) and tend to run very large. Good times in shallow waters with the backdrop of the Florida Keys backcountry. Baby tarpon run in size from 10 - 30 lbs. Usually found feeding off of a shrimp hatch or up against the mangroves in a peaceful environment. Fall is the best time for this sport, when boat traffic is light and the fish are not so beat up. Tarpon Fishing is supposed to be fun.